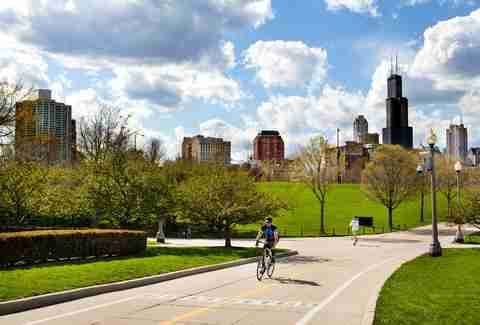 Whether you're a dedicated marathoner, a weekend warrior, or the occasional jogger motivated solely by the guilt of depleted potato chip bags, Chicago has wonderfully scenic routes for just about every kind of runner. While dodging manic cyclists and slow-moving pedestrians every few seconds is a surefire way to induce runner road-rage, the city’s solid hiking and biking trails also make for meritable runs. So lace up your sneakers and get ready to hit the most gorgeous stretches within city limits. It's hard to beat the most obvious, easily accessible running path in the city: the Lakefront Trail has panoramic views of the skyline, lake breeze, beaches, and parks -- even some with hills thrown into the mix -- and trail markers every half-mile to help track your distance. The trail's less-crowded north end generally makes it a go-to destination for uninterrupted running. The path veers away from the water just north of Belmont Harbor until Foster Beach, but it's easy to hook over to an unpaved, tree-lined stretch along the lake starting near Montrose Beach. It'll sync up with the main path again at Foster Beach, where you can continue north until it ends at Hollywood Ave before circling back. From Navy Pier, take the Lakefront Trail or, better yet, access the Lake Shore Drive overpass near the pier, which will keep you slightly closer to the water's edge as you head south to Northerly Island and the Adler Planetarium. You'll score some of the best, exhaust-free views of the city here, and the crowds will start to thin out on the 91-acre manmade peninsula. It'll feel pleasantly secluded winding through fields of wildflowers and prairie grass, but killer skyline views will keep you connected to the city and you'll clock a good six miles round trip. Everyone loves Chicago's Lakefront Trail, but it can get packed during marathon training season. The less-populated, paved North Shore Channel Trail, which runs along the east side of the Chicago River as you head the four miles north from the park at Argyle and Francisco to Skokie, is a runner's dream. The wooded path tames the wind and provides cooling shade on hot summer days as you cut through several local parks with plenty of water fountains. 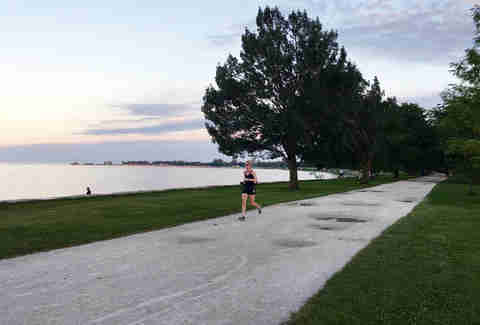 The River Park track is perfect for speed work, and adventurous runners can eventually connect to the Green Bay Trail for a longer journey up to the Botanical Gardens. Home to the annual Chicago Half Marathon, Hyde Park offers some of the best running spots in the entire city, and starting at the 500-acre South Side park from Devil in the White City (not to mention the future home for Barack Obama’s presidential library) would be a solid choice. Remnants of the 1893 World's Fair, like Osaka Garden, still exist in Jackson Park, but you'll also find beachside and bird trails to keep an afternoon run interesting. 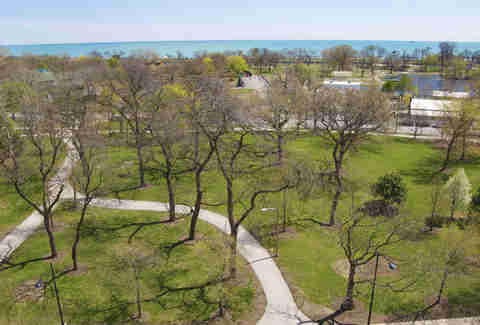 From there, head west along the Midway Plaisance, a beautiful green space that passes through the University of Chicago and connects with the 372-acre Washington Park. Looking to squeeze in a quick workout? The short, sleek Downtown pathway along the south bank of the Chicago River from Lake Shore Dr to LaSalle St makes for an ideal, architecturally appealing morning run near the water. 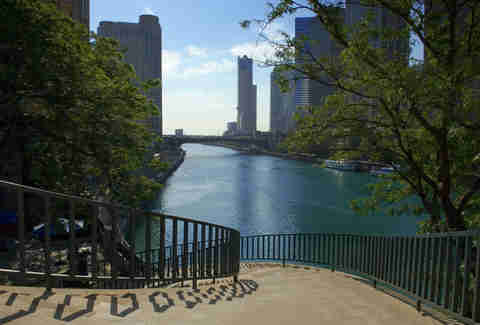 If the flat, easy route isn't enough to get your heart pumping, try breaking off the path to run up and down the Michigan Ave bridge stairs a few times. With 319-acres of lush green space, Chicago's "front yard" is an unexpected oasis in the heart of one of the busiest parts of the city. The city centerpiece is the site of world-class museums and beautiful contiguous greenspace with breathtaking lakefront views. While we wouldn't recommend venturing here during Lollapalooza or any of the other mega summer food and music fests, the spacious park's notable spots like Buckingham Fountain, Millennium Park, and Museum Campus are definitely worth exploring via its main four-mile running path as well as various offshoot paths and sidewalks. 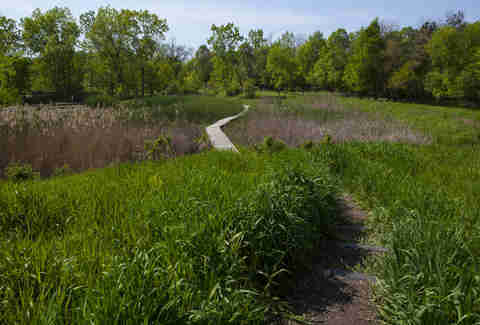 Most people stroll through the 46-acre wilderness oasis in the middle of the city, but there's no reason jaded urban joggers can't take a short jaunt through the largest city-owned natural area on the north side of Chicago. The serene nature preserve's trails and boardwalks leisurely wind through undisturbed woodlands, wetlands, prairies, and savannas. You'll probably want to slow down for the inevitable wildlife sightings like the resident marsh heron, but quiet, soul-satisfying treks are also good for the body, right? Like Grant Park, Lincoln Park has a lot going on: the city's urban green space has a free public zoo, history and nature museums, a conservatory, lagoons, and nature sanctuary -- all of which are mere steps from the concrete jungle. Marathon trainees can shake up their lakefront running regimens by taking a detour around the North Pond Nature Sanctuary or through the Lincoln Park Zoo, which is mostly pedestrian-free during off-hours (note: the zoo itself opens at 10am, but gates open to the public at 7am year-round) and you can choose from several routes to access different exhibit spaces. Whether you start near the seals or the lions is up to you. 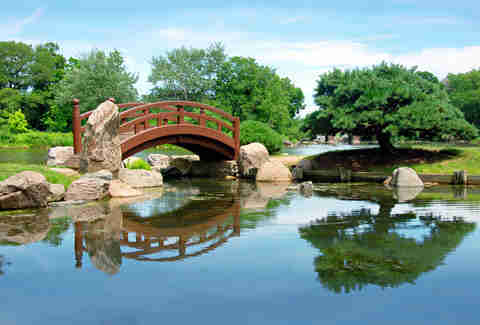 The beautiful, gigantic park in the Humboldt Park neighborhood has 219-acres of well-maintained trails, restored prairies, gardens, lagoons, monuments, bridges, skyline views from a massive hill, field houses, and a boat house. There's plenty of parking nearby, and it's never overcrowded, so there's room to explore the many pathways. Tack on more mileage by taking your run out of the park and heading north on the surrounding boulevards: Humboldt Blvd, Logan Blvd, and Kedzie Blvd feature green stretches and dirt paths alongside turn-of-the-century homes. 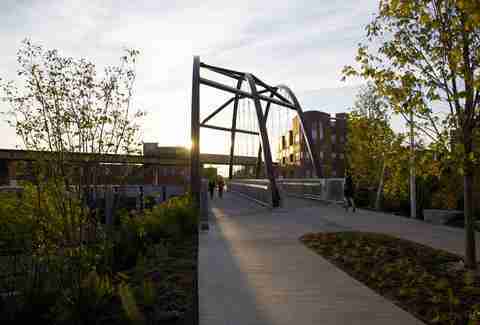 The elevated linear park trail cuts through West Side neighborhoods in need of more green space and recreational resources. Built along a former railroad track, the 2.7-mile Bloomingdale Trail (often called “The 606” by the kewl kids) has about a dozen access points and gives runners a chance to wind through Wicker Park, Bucktown, Humboldt Park, and Logan Square without traffic interruptions. Stretching above street level from Ashland Ave in the east to Ridgeway Ave in the west, you'll be able to take in interesting views of the city, including some elaborate graffiti murals and glimpses into local homeowners' windows. Nicole Bruce is a contributing writer for Thrillist. She'll slow her running pace to a power walk just to absorb every beautiful detail along these paths. Catch her on the Twitter at @nicoleabruce.